Hanoi (VNA) – The Presidents of Vietnam and the Philippines have pledged to further strengthen political and diplomatic cooperation via regular exchange of all-level visits and boosting ties on the Party, government, State, National Assembly and people-to-people exchange channel. 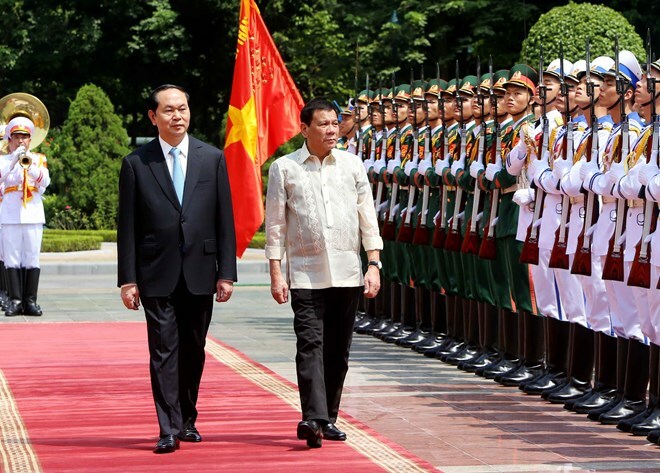 President Tran Dai Quang and President Rodrigo Roa Duterte made the commitment at their talks in Hanoi on September 29 during the Philippine President’s official visit from September 28-29. The two countries will also improve the efficiency of bilateral cooperation mechanisms, including the Committee on Bilateral Cooperation at the foreign ministerial level, the Inter-Committee on Sea and Ocean, the Joint Sub-Committee on Trade, the dialogue on defence policy, and the Joint Working Group on Fisheries. Both sides agreed to work closely together to prepare for the 40 th anniversary of diplomatic ties this year. President Quang welcomed Filippino investors to Vietnam’s agriculture, food processing and tourism and asked the Philippines to facilitate Vietnamese businesses’ investment in infrastructure, oil and gas survey and exploration, mining and services. He affirmed that Vietnam will offer stable and long-term rice supply to the Philippines. The two Presidents agreed that national defence-security is an important pillar in the bilateral strategic partnership, and vowed to effectively use existing cooperation mechanisms, including the policy dialogue at the deputy defence ministerial level, while bolstering ties in research and training and the sharing of experience in the UN peacekeeping mission. The two leaders promised to direct their security agencies to exchange information and cooperate in the fight against crimes, terrorism, drug and human trafficking, and quickly launch negotiations to sign agreements on extradition and the transfer of sentenced persons. Regarding collaboration in sea and ocean, farming, transport, culture, tourism, people-to-people exchange and education, President Quang spoke highly of the Filipino government’s humanitarian policy and cooperation in fishing boat- and fishermen-related issues over the past years. He took the occasion to ask the Philippines to consider releasing all Vietnamese fishermen currently detained in the country. On regional and global issues of shared concern, the two sides pledged mutual support of the Philippines in hosting the ASEAN Summit and Vietnam in hosting the Asia-Pacific Economic Cooperation (APEC) Summit next year. They agreed to continue coordinating with other ASEAN member states to successfully realise the ASEAN Community and uphold the ASEAN’s solidarity and central role in the regional architecture. The two sides reiterated their support of the full and effective implementation of the Declaration on the Conduct of Parties in the East Sea (DOC) and cooperation for the early formulation of a Code of Conduct in the East Sea (COC).